You are in : All News > An earth-friendly plastic replacement? 16 Apr 2019 --- The quest to keep plastic out of landfills and simultaneously satisfy the needs of the food industry is filled with obstacles. Researchers from The Ohio State University have developed a biodegradable plastic with both sturdy and flexible traits, meaning it has the potential to be shaped into food packaging. This rubber-toughened product derived from microbial fermentation could perform like conventional plastic, note the research team. The team are now setting their sights on preparing the material for commercialization and seeking materials to possibly use as fillers to further strengthen the mix. Almost all plastics currently on the market – about 90 percent – are petroleum-based and are not biodegradable. Anti-plastic sentiment has risen exponentially in recent times, especially in light of the increasing visibility of plastic packaging waste in marine environments. It is now believed that there are 5.25 trillion pieces of plastic debris in our oceans, according to National Geographic data. A recent US study estimated that marine plastic pollution translates to an annual loss of US$2.5 trillion for society. A biodegradable replacement for petroleum-based products has to meet an array of standards and, so far, attempts at viable alternatives from renewable sources have faced limited success. Among the obstacles, products to date have been too brittle for food packaging, note the researchers. Click to EnlargeThe new bioplastic and rubber blend devised by Ohio State researchers proved much more durable than the bioplastic on its own. Credit: Ohio State University. The new bioplastic and rubber blend devised by Ohio State researchers proved much more durable than the bioplastic on its own. Credit: Ohio State University. 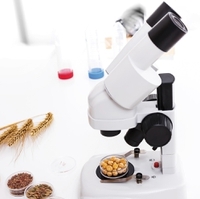 “Previous attempts at this combination were unsuccessful, because the softness of the rubber meant the product lost a lot of strength in the process,” says lead author Xiaoying Zhao, Postdoctoral Researcher in Ohio State University’s Department of Food Science and Technology. The end product was 75 percent tougher and 100 percent more flexible than PHBV on its own – meaning it is far easier to shape into food packaging. It also was found to degrade in 45 days in an aerobic lab-scale composting system. Other research teams have combined rubber and PHBV, but the products have been too weak to withstand all the demands of a food package. This includes processing, shipping and handling in stores and homes, especially containers that are used for freezing and then microwaving, says the study’s senior author, Yael Vodovotz, a Professor of Food Science and Technology at Ohio State University. Increased flexibility, without a significant loss of strength, is particularly important when it comes to plastic films commonly used to package everything from fresh produce to frozen foods, she adds. Now, the technical aspect of the material still requires further research, she adds. The thermal processability of the materials is needed for it to become a commercial reality, and the group is actively working in this area. The researchers’ current focus is also on the potential use of various biodegradable – and otherwise environmentally conscious – materials they might use as fillers to further strengthen the mix. They’ve discussed using the “cake” left behind after a fellow researcher extracts oil from spent coffee grounds. Tomato skins are under consideration, as are eggshells. “We want something that would otherwise go to waste that is sustainable and also relatively cheap,” Vodovotz says. The increasingly urgent drive to create materials that compost or degrade in natural or aerobic environments has spurred several notable innovations. And plant-based plastics, otherwise called bio-based, are infiltrating the mainstream. Sealed Air Corporation is increasing production of its plant-based packaging for food applications. The company is investing in capacity at its Simpsonville facility, which will be the first in the US to produce materials made from Plantic – a bio-based polymer with barrier properties – and post-consumer plastic. Total Corbion – a collaborative venture between Total and Corbion – launched a 75,000 tons per year PLA (polylactic acid) bioplastics manufacturing plant based in Rayong, Thailand, in December 2018. The facility produces Luminy PLA resins, a biobased and biodegradable bioplastic that could play into a circular economy. PLA products can be chemically or mechanically recycled or composted and used as fertilizer. Click to Enlarge 40 million Arla packages will be made entirely wood-based and ready for the market this year. 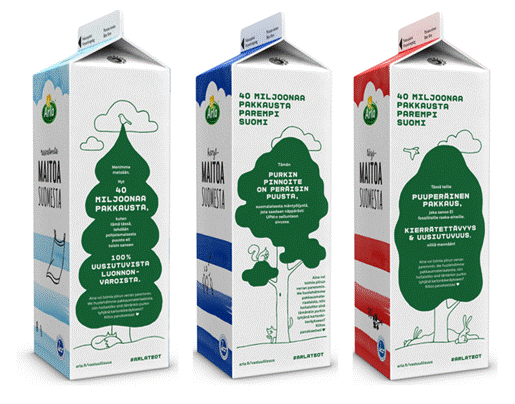 Arla Oy, meanwhile, has become the first company in Finland to use renewable, wood-based bioplastics for the thin plastic film necessary in gable top, paperboard cartons for milk, yogurt and cooking products, in collaboration with UPM Biofuels. As a result of the sustainability-oriented revamp, an estimated 40 million Arla packages will be made entirely wood-based and ready for the market this year. Some researchers have even been working to create edible films that could be used for packaging. Recent research from the University of Borås, Sweden, created edible, bioplastic films and 3D objects from fruit waste. Veronika Bátori, who recently received her doctorate, investigated the use of fruit waste in biomaterials in her thesis and chose to study waste from apples and oranges. Although the research for 3D shaped objects, such as mugs and plates, is in an early phase, Bátori told PackagingInsights that the materials are promising. Also, a team of scientists at Samara Polytech in Russia created edible films consisting of only natural ingredients in the summer of 2018. The packaging is based on fruit or vegetable puree and low on caloric value. The product was initially designed for to be used by astronauts, as many packaging materials are inconvenient in space due to difficulties around disposal methods.